Now under construction, the Fairgrounds and Fuller Park Loop is 1.8 miles of 8-foot-wide concrete recreational trail located near other City and County recreation areas—such as the County Fairgrounds, City Park, Campgrounds, and Aquatic Center— and is intended to provided a safe and convenient outdoor recreation resource to the area. A 2016 Community Survey identified recreational trails as the top priority for area citizens. The Fairgrounds & Fuller Park Loop project, to be completed by Fall of 2018, is the first leg of a multi-phased initiative designed to fulfill this need. 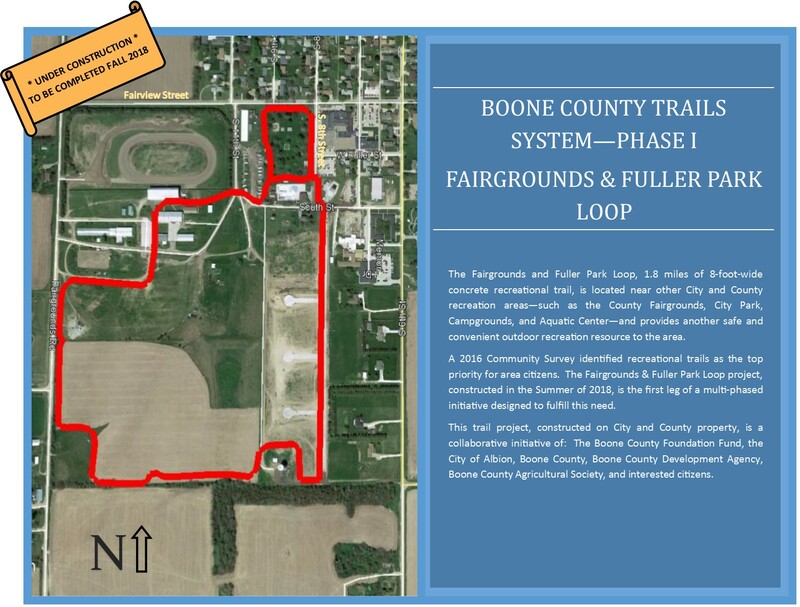 This trail project, constructed on City and County property, is a collaborative initiative of: The Boone County Foundation Fund, the City of Albion, Boone County, Boone County Development Agency, Boone County Agricultural Society, and interested citizens. Andrew L. Devine has been the City Administrator/Clerk/Treasurer of Albion, Nebraska since August 2007. He was formerly a project manager for a large Nebraska trucking firm. Andrew has a Bachelor of Arts Degree in Business Administration and Communications from Nebraska Wesleyan University in Lincoln, Nebraska. Andrew also obtained the Certified Public Manager designation from the University of Nebraska - Omaha in 2008; the Certified Municipal Clerk designation from IIMC & the University of Nebraska - Omaha in 2011; and, the Master Municipal Clerk designation from IIMC & the Universty of Nebraska - Omaha in 2018.